These days, a pumping sound system is a must-have for any vehicle. Toyota takes this idea up a notch with the 2019 Sequoia. This admired full-sized SUV is available with a high-quality sound system from JBL. The JBL Synthesis audio system utilizes 14 different speakers. They're engineered specifically for the Sequoia's cabin. Their unique build and strategic placement ensure that the audio quality is crisp and clear for everyone in the SUV. It also includes a subwoofer that can make any song pop. When paired with the advanced infotainment center, this sound system is capable of taking full advantage of your media library. You can hook up your smartphone with a USB cable or through wireless BlueTooth technology to enjoy your favorite songs and streaming services. Want to hear this sound system for yourself? 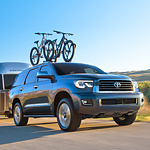 Stop by Toyota Of Plano today to take the 2019 Toyota Sequoia out for a test drive.